at noon and by moonlight. Last month (I think), I volunteered to host a Re-Read Challenge, and Kristen M volunteered to co-host. We have been emailing each other back and forth about the logistics, and we plan to have the challenge officially start in January. Though if you decide to reread a book before then and want it to count, that is fine, too. I am not sure if we should set up an entirely new site to link to people's reviews. I personally have no desire to maintain another website, so I'm going to see what happens with Kristen and I hosting on our blogs. If it seems that, based on sign-ups, we should set up a separate site for the challenge, then maybe we'll do that, too. But at this point, I think we can just make monthly posts with Mr. Linkys set up so that everyone can see other people's reviews. We still don't have any buttons. As Eva can attest, I have seriously abysmal button-making skills. We all have different skill sets, I suppose, and Microsoft Paint is not one of mine. Really, anything involving artistry or coordination of any sort is not really my forte. I have equilibrium issues. It's risky for me to drink red wine on white carpet. But I do it anyway because I like to live dangerously. So, this is the part where I beg people to make us buttons. PLEASE! Nothing flashy (haha- even though it's the Flashback Challenge! ), just serviceable. Maybe a picture of a little kid reading a book? Or an older person reading a book? A flashlight and a book? Or something retro? Something with a quote such as Holbrook Johnson's, "Books worth reading are worth re-reading"? 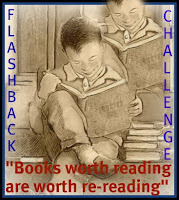 The Flashback Challenge will run from January 1, 2010 - December 31, 2010. If you're super-excited and want to reread a book before that, feel free, and let me know. If many people do so, then I'll do a December challenge linky post and you can all link to it here. Otherwise, we can hold them over to January. Thus, if you sign up for the Bookworm level, you could ostensibly choose to read one book from each mini-challenge. Or you could choose to do none of the above (though, granted, not sure what you could have possibly read that does not fit into either childhood, high school or adulthood). Also, would just like to make clear that this isn't specifically limited to books you loved reading previously and want to reread. It could also be a book you don't remember enjoying. Or just don't remember reading. It might be interesting to see how your perceptions may have changed. Ok, that's all. Here's Mr. Linky for everyone to sign up (with or without their reading lists). I'll post mine tomorrow! Quick question - do you mean it runs jan - Dec 2010? You have 2009 here. Great challenge. I am participating. I too don't have creative skills :) , so won't be able to make a button but if u need any other assistance with the challenge will gladly help. I love the buttons. I am so jealous of people who can make them! Sheila has some pretty impressive skills with the computer; she has lots of innovative features on her blog! Love those buttons! :) You know I'm in for the literati level! Love the buttons! I am going to join in, but I will have to wait to sign up formally when I have a post. I'm in! The second I come up with a list for the literati level, I'll post.Thanks for hosting this. I'm so excited. I'm actually already doing this as a perpetual challenge, so am signing up to do it for 2010. I have a bunch of books that I want to re-read someday. I'm signing up for the Literati level. Thanks for hosting! I'm planning to sign up for this challenge, but probably not until things slow down a bit for me after Thanksgiving. I really like the idea for this challenge, and think I am going to participate, even if it is just in the Bookworm category. I am getting so excited about all the new challenges coming up and trying to figure out which ones I can complete! Great idea Aarti! I'm signing up for the book worm level and will try to do each book a mini-challenge book. Haven't quite figured out what I'll read yet, but I am looking forward to it! yay for reading challenges! thanks for hosting. since this is my first challenge I'm going to sign up for the bookworm level and will fill in Mr. Linky soon. Looking forward to re-reading for this challenge! Sorry that I double-posted in the Mr. Linky. I realized that I didn't link to my challenge post the first time. three books I can handle -whew! I joined! sorry its not a dedicated challenge post (I'll make one later)! (re: your comment on my post) I am doing quite a few challenges, but I'm pretty sure they all allow overlaps. I'm a book challenge virgin, but I love the sound of this one. Sign me up for Literati level.I'm really looking forward to participating. Yay! This will be fun - I'm in! I am nto big on re-reading or even goingto the same old vacation spot eery year, but I really forgot most of the books I read over 20 rys ago. Read one for a challen ge, did not remember anything of it. Awesome challenge. I plan to be a bookworm this year and reread 3 books from different parts of my life. It should be pretty interesting to see what I think of each of these books now. I just finally got a list together! It's going to take me a good amount of time to get through them but my goal is to re-read fifteen to twenty books ... partially to decide if some books are worth keeping. Wow, this is great! I was thinking I would like to re-read a few books I have read in the past and maybe turn it into a challenge, and voila - here you are! I am going to do the 4-6 book challenge, scholar. I am so excited about this Challenge! Looking forward to it - thanks! This is a great idea. Maybe the books I loved as a child will still appeal to me, and perhaps the ones I hated from high school will be delightful now. Thanks for doing this. I'm in! I'm going for the literati level! I'm in! I'm going to participate at the Bookworm level. 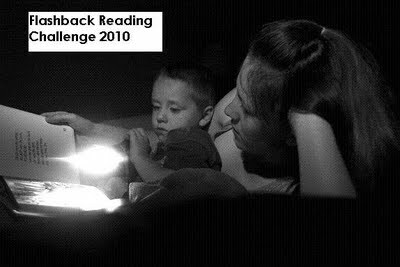 I've posted about your challenge on my blog - http://myreadingtable.blogspot.com/. Thanks so much for hosting this challenge. I'm signing up at the literati level, and am excited to get started! Hi! I've signed up for the challenge at the Bookworm level. I'll post my choices soon! Cheers! Gone With the Wind is first on my list. A Dickens book might be second. I have no idea why that happened! I wonder if Mr. Linky expires after a certain amount of time? Hmm... just put it into the January one, I'd say. I would love to link up to this challenge for sure!!!! As level Literati!!! But the Mr. Linky is not working!!! I am going to add a link though on my sidebar!!! Great idea! Hoping to complete the Literati Challenge - looking forward to re-reading books that I've been meaning to re-read for ages - love your blog btw - came across it by accident the other day. Perfect challenge...I was running through my head the other day a huge number of books I would love to re-read...hope to achieve literati! 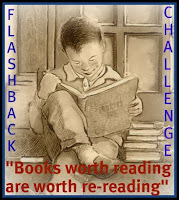 I posted a page with ALL current reading challenges. Let me know if you want me to add any other information to your challenge. I hope it brings even more readers to your challenge! I was updating my challenge blog and finally noticed your comment about the linky working so I came over to post my link and...it's not there again! I have perfect timing, do I not?! It's saying something about upgrading or something in red. Anyway, I'll check back again to see if it's fixed. Hi, Aarti. I've officially signed up. Here is my signing-up post. And as I've mentioned in this, here is the post on a book I've re-read last month. Thanks for letting me join at this late date. And as I'm a bit technologically challenged, would you mind mailing me about how Mr. Linky works and how I can incorporate him into my post?